The Lower American River runs through Sacramento, so it’s close to many outlets for river gear. Private boaters have many options like REI, California Canoe and Kayak, and other big sports stores. If you don’t have your own stuff and want to rent, two companies offer everything you need for a float down the American River. Two companies based in Sacramento will rent you all the gear you need: River Rat and American River Raft Rentals. Available equipment includes rafts, inflatable kayaks, paddles, and life jackets. Both companies are located off Sunrise (you park and put-in on their property) and have small stores selling sundry items like sandals and sunscreen. They also arrange lunches if you don’t want to pack your own. Shuttles are another service you can add for a little more money. For a slightly longer float choose River Rat, and for a slightly shorter float choose American River Raft Rentals. California Canoe and Kayak has been in Sacramento since the early 1970s and has a large selection of paddlesport gear at their Rancho Cordova store. REI is always a good option as well. 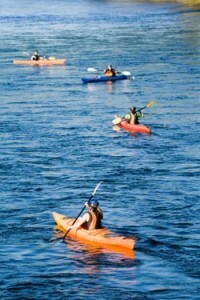 Kayakers might also want to check out Kayak City. During the heat of the summer, don’t forget to bring your water guns and other water fighting equipment. Buckets actually work great for drenching other rafts!